Mr. Angelos, I have an offer for the Orioles for Erik Bedard. Let me outline the background and terms for your consideration. It is an extremely fair offer. Okay, who am I kidding, it is monstrously lopsided towards your team, but I guess you understand the desperate situation we're in right now. Before there is any agreement with your "general manager" - you will, of course, have final say. By the way, you really do have a lovely Mercedes S-class sedan. I didn't know they made cars with more than 600 horsepower. Wow. We will, of course, allow you to subject all of the players involved to a rigorous physical prior to completion of the trade. I will put this in writing. If any one of the players happen to speak of the trade to the media, I will publicly reprimand them. In fact, if any one of the players talks about the trade before completion, I will attempt to ruin their week - perhaps hang the trade over their head without resolution or prevent them from playing in an important game, or maybe even miss witnessing their first born child walk for the first time. If any one of the players fails to meet the physical to your satisfaction, you have the authority to void the trade or request a new player. In fact, should one of the players involved fail the physical, because of your time lost, I will force them to sell crackerjacks at our single-A affiliate in Appleton, Wisconsin wearing a skirt and a t-shirt that reads, "I am a failure and I wasted the time of a millionaire". Mr. Angelos, I can tell that you're already unhappy with these terms, so let me just include another player to be named later - any player of your choice, your call. Can I just say that you're looking particularly healthy these days? If, after the trade is agreed upon and Adam Jones takes the field and you are unhappy with his performance during the first week, you can request Bedard back. In fact, if you're unhappy with anything about Adam Jones - his attitude, the way he wears his stirrups, or even his facial hair, call me - we'll work something out. If you agree to this trade, you will drink Starbucks for free for the rest of your natural life. If you agree to this trade, your children and your children's children will have unlimited Nintendo games for their respective lifetimes. Mr. Angelos, I can see that you are great and wise and I hope you find the terms of this deal acceptable. Degenerative Hips, Ambulance Chasers, and Bad Negotiating. McPhail: "Hey, how are you?" B: "Fine, fine... Pelekoudas just brought me a nice ham sandy and a venti latte." M: "you still got Squiggy doing scouting for you guys?" B: "hmm...I'd have to ask Looper, I don't know. So hey - you want to do this Bedard deal or what?" M: "Jones and who was it again?" B: "Sherill, Tillman, your choice of a couple PTBNL's..."
M: "You sure you want to do that? Bedard is good, but..."
B: audibly eating sandwich..."job's on the line, Andy - I can't wait for next year. I mean, come on - didn't you see I gave Silva almost $50 million? M: "Hahahahahah...oh, man...Bill...you're killing me... that's rich... okay, yeah, sure - let's do this thing. Get Jones on a plane to Baltimore for a physical"
M: "I just need to talk to Peter to get the go-ahead"
M: "oh, don't worry - he brought me here so I could make deals like this on my own"
M: "just hold the line, Billy..."
Angelos: "Andy, this better be good, I'm having my Monday rub-n-tug"
M: "Seattle wants to give us Jones, Sherill, Tillman and a couple others for Bedard." A: "Honey, honey...stop that for a minute... Andy, say that again?" A: "Do they want Roberts too?" A: "Huh. So they're not that bright. Make something up to throw a wrench in the deal and get other teams involved to drive the price up." A: "I don't know, something that will scare Baltimore fans. Think of Joey Belle... say he's got a bum hip - leak it to the press"
M: "doesn't that seem unethical?" A: "Bwahahahahahahah...bwahahahahahah... you're funny Andy, that's why I hired you. Gotta go. Okay, toots, I ain't got all day, get back to work..."
M: "uh, Billy - you still there?" B: "Yeah, just called Adam to tell him to get on a plane, that he's being traded for Bedard. Kid is disappointed - Venezuelan finals and all - but understands." M: "Yeah, uh - Peter has some personal matters to tend to today, so we'll have to get back to you, maybe tomorrow or the next day." M: "nothing to worry about, I'm sure it's just his osteoarthritis or something"
M: "nothing. Forget it... we'll talk tomorrow"
B: "Sally, get Adam on the phone and make sure he doesn't say anything to the press about this. And call the Twins for me. Then get Willie in here to wax my head." This thing is on again, off again like a well priced dancer on the Vegas strip. Reports had Jones on a plane to Baltimore to take a physical as part of a blockbuster trade for the M's, and now it seems that he's still in Venezuela and the whole thing might have been terrible translation between the club and the Venezuelan press. If so, that's pretty funny. Regardless, there's obviously some teeth to this thing beyond the typical aluminum-hat 'net speculation. By most accounts, it looks like the O's are due to receive Jones, Sherrill, and Tillman plus a "fourth player" (when is the last time a PTNL turned out to be any good?) and the only thing holding it up is Peter Angelos himself (which is one giant ego roadblock). Reports have Angelos out of town Monday, so maybe we'll get nibbles of news about what he's thinking tomorrow or Wednesday. If you ask the great underbite himself, Ken Rosenthal, Angelos has or is likely to kill the deal anyway. So around and around we go. Where's the waitress? Another 8 dollar Heineken! M's offense was terrible in the 2nd half of 2007. Can they afford to make it worse? Dealing for Bedard after giving Silva a huge pile of cash will prove one of two things: 1. M's didn't have a cohesive strategy this off season. No way Bavasi would deal for another starter after spending a pile of cash on a guy who may be worse than Morrow. 2. M's don't believe Morrow is ready to start. Morrow's development as a player is being damaged by the M's. Why spend months in winter ball getting acclimated to becoming a starter to only be throw into what is likely a setup role for Putzer? Ibanez and Wilkerson in the same outfield is going to make the M's pitching worse. Pitchers hurt all the time. Hitters hurt some of the time. Bedard has a couple of good years, and only one great year. However, if he had 2 great years there is no way the O's would deal him just for prospects. Is there ANY way we can toss Lopez and Clement into the deal and get Brian Roberts? How great would that be? If Jones has a mediocre rookie season, and Bedard has an average "Bedard" season in 2009, Bavasi is a genius who sold high. If Bedard gets hurt and Jones puts up a Rookie of the Year quality campaign, this one will go next to Soriano for HoRam as another Bavasi blunder. Tough call. This deal is not an obvious stinker like the Soriano deal (Congrats to the Braves by the way for resigning Soriano for 2-years, $9 million just as they are about to hand him the ball in the 9th inning. 35+ saves later that deal will look like a bargain.) But it is a risk. 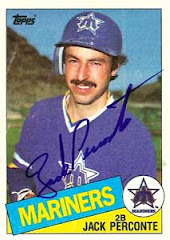 So I tip my cap to Bavasi and hope Bedard retires a Mariner great. Hopefully sometime after 2010. Ahem, that is - if it happens. With pitchers and catchers reporting in a few weeks I was flipping through some old Sporting News Fantasy Baseball Owners Manuals, recognized as a premier publication for annual projections and player analysis. On the surface the only thing connecting fantasy baseball with the real are stats. However predicting performance is similar in MLB as it is in the fantasy world. Performance projections are everything when a GM is evaluating his roster for the upcoming season. So it struck me how nobody, not even Felix himself, is able to project with any confidence how the crown jewel in the Mariner's rotation will perform in 2008.
and will get even better. Nine of his 12 starts were quality starts. Bottom Line: King Felix already is a No. 2 (fantasy starter) with upside. Projected 2006 fantasy value: $20. 2006 Result: 191 IP, 12-14, 176 K, 4.52 ERA, 1.34 WHIP. Actual fantasy value: $13. closer to power in '07. Projected 2007 fantasy value: $14. 2007 Result: 190.1, 14-7, 165 K, 3.92 ERA, 1.38 WHIP. Actual fantasy value not available yet. 2008: All I was able to dig up is that TSN has Felix ranked as the 28th best starter in baseball for 2008. Last year that was equal to a projected fantasy value around $17. Or about 15% less than they thought he would be worth two years ago. 2008 is a make or break year for Felix in the sense that he could slip back into 2006 form, or take a step forward towards becoming a #1 starter. He's very young, so that's not to say he will never develop into a top starter if he doesn't do it in 2008. But how long can someone tread water with a WHIP pushing 1.40 and still be considered a team's number one starter? (If your name is Barry Zito the answer is 3-4 seasons.) If he regresses the Hernandez situation will start to smell more and more like Freddy Garcia. And I don't mean just the stench of the bar at Jalisco's. Felix is more exciting to watch than Freddy Garcia ever was. But another mediocre season and his act will tire just as Garcia's did. While the soap opera continues to play out with regard to Erik Bedard and Adam Jones being an Oriole, a Mariner, an Oriole, and a Mariner again, there has been much talk about whether or not Bedard is the singular cog that will propel the M's into the playoffs anyway. Most assessments say no, and they're probably right. I've lamented the M's rotation repeatedly on this blog - that basically we have a #2 starter and then three #4 starters - and then who knows what for a fifth. Three starters roughly at league average with one capable of being pretty good. That's at best. This rotation doesn't inspire October fantasies. However, I recently read this post about the St. Louis rotation. Yeesh. I mean, that actually shocked me when I read it. This is the same St. Louis Cardinals team that won the World Series in 2006. Do they even have a pitcher that you would expect to win 12 games going into 2008? Wainwright is obviously the gem of the group with an ERA+ of 119, going 14-12, giving up more hits than IP, and striking out a paltry 136 batters over 202 innings. Wainwright is good, but on a playoff team, he should be a #3 or #4, not your ace. Clement last saw action in 2006 where he was shelled like his nickname was HoRam, then hit the DL and sat out all of 2007. Although he won 13 games with Boston in '05, he still wasn't lighting the world on fire with an ERA+ of 99 and a 4.57 ERA. His most productive years were in Chicago from '02 to '04. Well, Matt - it's 2008. Where you been? This is their "#2" starter. Looper? ERA+ of 89. A failed conversion from closer to starter. Pineiro? Do I even need to tell you? Mulder - ERA the last two years: 12.27 and 7.14, respectively. He was once great, but injuries have simply ruined him. Reyes or Thompson will probably occupy the #5 slot by April - and that shouldn't make any Cardinal fan excited either. Their rotation is so bad that the author of that post actually makes a pitch for going after Jeff Weaver. Yes, that Jeff Weaver. If that's not desperation, I don't know what is. They might as well ask Ankiel to take the hill if they're in such dire straights. I guarantee he'd have better stats than Weaver. So my point is, after reading this I gained a little bit of perspective. While I don't think the Mariners have a particularly exciting pitching rotation - I'll take Felix, Batista, Silva, Washburn, and Morrow (Dickey, HoRam, Rowland-Smith, whoever) over what St. Louis is trotting out there. But then again, when you start comparing yourselves to the worst possible scenarios, you've got problems - but I'll take my silver lining for now. What do you know, it's 리마콩 시간! Tough to imagine an easier year to improve your standing in the AL West considering how the offseason has gone for all four teams. Sure, the Hunter signing was impressive in LA. But Hunter is not a superstar. He should help solidify the Angels lineup, but the loss of Orlando Cabrera isn't going to help things offensively. Jon Garland is ok, but not much better than a #3 starter. LA and Texas have made some nice improvements. Seattle hasn't made a significant move and Oakland has all but punted the 2008 season. (That's not to say that Silva's money wasn't significant.) Assuming Texas and Oakland don't compete for the division, Seattle could be only a couple of LA injuries away from being in a 2-team battle for first place. Rather than make a trade or (another) signing they might regret, I wouldn't mind seeing the Mariners stop chasing mediocre talent and hold some cards to make a deal in early June. A friend sent me a link to a great new site called Sporcle. I see a few great uses for this site. Extremely easy way to take on the predictions of national experts. For example, here is a link to their MLB Pundit page: http://www.sporcle.com/group/?gid=24. So basically you can go in before the 2008 season, enter your predictions for each division and see how your picks stacked up against guys like Gammons, Stark, Olbermann, etc. For future reference I'm going to put a link in our resources area.